Double Amputee, Oscar Pistorius, Allowed to Compete in Olympics! In a previous post, I introduced you to a Bilateral Below Knee Amputee who is a very fast and talented Sprinter. As you would expect, any running story is interesting to me and any amputee story is almost as hard to pass up, so stories about amputee runners simply must be showcased!! Oscar Pistorius holds the 400 meter Paralympic world record of 46.56 seconds. 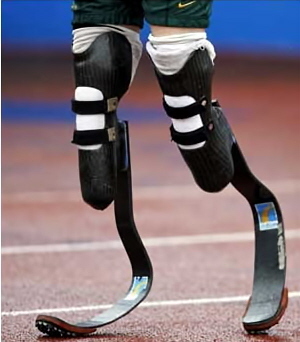 He has been trying to be allowed to compete in the regular Olympic in Beijing this summer but had previously been denied eligibility because they said he had an “unfair advantage” over able bodied runners. Word just came out that he will be allowed to try to qualify after all. Fox Sports says that, “Pistorius appealed to CAS, world sport’s highest tribunal, to overturn a Jan. 14 ruling by the IAAF which banned him from competing against able-bodied runners. The IAAF said his carbon fiber blades gave him a mechanical advantage. A two-day hearing was held before a panel of three arbitrators at CAS headquarters last month. I think this is great . . .
~ by legmaker on May 16, 2008. In terms of the Olympic qualifying deal, that’s cool. Give him a chance! If it were really an unfair mechanical advantage, wouldn’t he be crushing existing world records rather than fighting to meet the qualifying time? Brian–I know John Siciliano! How cool is that?! You make a good point about Oscar Pistorius. He would be doing even better than he is if he had an advantage over able bodied runners. I saw this guy on the TODAY show this morning. They had video of him running and its absolutely amazing to watch him! !